The Energy Department has given a key weapons lab an "inadequate" rating for its latest safety record on "nuclear criticality," a measure of atomic stability. Los Alamos National Laboratory received the weakest nuclear criticality safety rating of all U.S. nuclear weapons laboratories, though its performance is assessed to be getting better, according to a report released last week covering fiscal 2013. Deputy Energy Secretary Daniel Poneman submitted the assessment to the Defense Nuclear Facilities Safety Board. Nuclear criticality typically refers to a balance of neutrons in a reactor, with "subcriticality" suggesting underproduction and "supercriticality" suggesting overproduction. Nuclear criticality safety is the practice of preventing atomic chain reactions from taking place in fissile materials outside of reactors. The Los Alamos facility in New Mexico had 38 nuclear criticality safety infractions in the last fiscal year and received an overall performance rating of "does not meet expectations." "Operations in the main plutonium facility at LANL were paused in June 2013," the 75-page annual report states. "Resumption from the pause will occur on an operation-by-operation basis once the associated procedures are validated from a conduct of operations perspective, criticality controls are verified to be adequate and flowed into procedures, and operators trained." The National Nuclear Security Administration "in general" has had "difficulty hiring and retaining qualified criticality safety staff," with Los Alamos and the Y-12 National Security Site experiencing more difficulties in that arena than other weapon sites, according to the report. The Y-12 complex, located in Tennessee, received an "adequate" performance rating, even though it had 71 infractions. 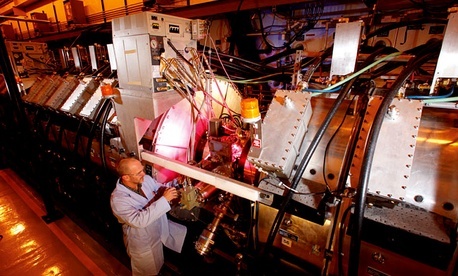 Lawrence Livermore National Laboratory in California had the highest rating of any of the sites. The California complex's overall safety performance was judged "excellent," with only one criticality safety infraction occurring in the last fiscal year. The Nevada National Security Site's overall performance was described as "adequate, but does not fully meet requirements," though it recorded just one minor infraction. Sandia National Laboratory in New Mexico was given a safety rating of "adequate," with no infractions reported since fiscal 2009. Meantime, the Pantex Plant in Texas also was given an "adequate" safety grade, with no infractions reported in more than 20 years.